Joe Dauria, Mark Vanek and Maria Petralia at Fratantonio's Barber Shop. On March 20, 1962, George Fratantonio moved his barber shop from Taylor Road, where it had been located for 22 years, to the Fairmount Circle Medical Building on John Carroll Boulevard, almost directly across from John Carroll University. Now, more than 52 years later, the barber shop is still in the same location, and it is still owned by the Fratantonio family. Over the years, Fratantonio’s Barber Shop has become an institution in the Heights, and it has had many famous customers, including Art Modell, back when he owned the Browns; former U.S. Senator Howard Metzenbaum; and former Ohio Governor and U.S. Senator George Voinovich. The shop’s current owner is “Sonny” Fratantonio, George Fratantonio’s son, and the manager is Mark Vanek, 34, who has worked at the shop for 13 years. 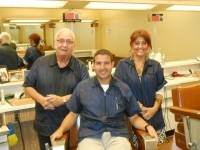 The shop also employs three other barbers: Joe Dauria, Maria Petralia and Jo Ann Medaglia. The shop is open five days a week, Tuesday through Saturday, and it opens at 6 a.m., which is extremely early for a barber shop. “We usually get from six to eight people early in the morning, before 8 a.m.,” Vanek said. “And then it gets busier as the day goes on.” The shop doesn’t require appointments, and most of the customers are walk-ins. Tuesday through Friday, 6 a.m. to 6 p.m.
Saturday, 6 a.m. to 5 p.m.